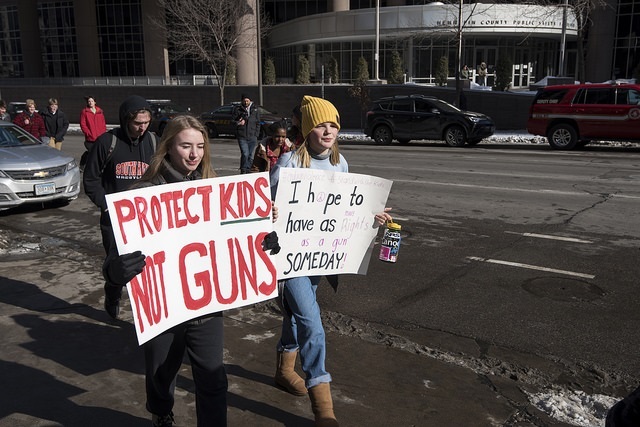 There was immediate blowback; the Parkland shooting have led to a remarkable level of engagement among high school students on issues of gun violence and regulation. But the threat of suspension could have a significant chilling effect on student activism: colleges can revoke acceptances for, among other things, disciplinary actions. So in theory, a student in the Needville Independent School District, who has already been accepted to college, could have her acceptance revoked if she participated in a protest (or awareness!) and was suspended. In response to Curtis Rhodes’s threat, a number of universities (led, as best I can tell, by MIT) have announced that peaceful protest will not jeopardize students’ admissions. Among those universities? The University of Utah, Westminster College, and BYU. Update: per the comments , also Southern Utah University. I have been perfectly willing to criticize my alma mater when it has done offensive and bad things in the past (for example, before it changed its policy to allow Sikh students to wear beards). But I want to praise it when it does the right thing, and this is clearly the right thing. So good for you, BYU. Thank you for making clear to students that their exercise of their political voice will not jeopardize their admission. And for prospective BYU (and U of U and Westminster College and hundreds of other schools) students: you can participate in tomorrow’s walk-out. You can march on March 24th. Make the world a better place, and do it without losing your college spot. [fn1] Note that there are almost certainly constitutional issues with Curtis Rhodes’s threat, but we’ll leave those aside. I agree. This is a very encouraging (and, to me, a bit surprising) move by BYU! Since I work at BYU, this makes me smile. Good for you, BYU. You’re certainly not perfect, but in this you have made us all proud. This makes me proud of my school. Thanks for pointing it out, Sam. I agree that this is encouraging, and slightly unexpected. I didn’t attend BYU, so I’m not sure what the policy is for demonstrations/protests on campus. Will these same students, once they are accepted and arrive in Provo, be able to continue to make their voices heard through public displays such as these, or will there be sanctions for doing so? Basically, it’s nice to say that doing this as a HS student won’t impact your potential admission, but might it impact their continued enrollment? Thanks for letting us know; I was not aware of the issue, and as an alum I’m happy to see BYU making the right call here. Kudos to BYU… though I have to admit to wondering if there’s a hidden pitfall here that we’re not seeing… it is so unBYUlike. As one old enough to have participated in student walkouts over the Viet Nam war I highly support this activity and am encouraged by our youth. yes, but what about BYU-Idaho? Or should I not bother to ask? Wow! The few protests that happened when I was at BYU (late 00s) seemed so discouraged and looked down on that I didn’t expect this from them. There was never a formal policy that I was aware of, but everyone seemed weirdly proud of the fact that BYU hadn’t seen a large protest in decades. Looking back, I wish we’d been more engaged. That said, I’ve never heard of students being disciplined for any sort of political activity or protest off campus, or any sort of political speech on campus that didn’t involve a large group. ^ i meant “gatherings aren’t allowed on campus **without** approval.” I hope that’s obvious. Wait – just to be clear, the policy announcement is only about admitted students, not current students, right? In other words, I don’t think this does allow protesting on campus (though it may or may not already be allowed, condoned, tolerated, whatever). I genuinely wonder if the NRA is trying to put pressure on school administrators to discourage these protests. A large popular movement for gun control is terrifying to them because it paints the NRA as what it really is: the alliance of a few hundred thousand Walter Sobchak types, most of whom have no business anywhere near an instrument of lethal force, with firearms manufacturers.